This article provides a high-level overview of the import process in LGL. Click into the help topics listed at the end of the article to read detailed instructions on any part of the process. Give each of the column headers in your spreadsheet a unique name. This will help you map your data to LGL’s fields. The first row of information in the spreadsheet should contain the name of each field to be uploaded in its own column. See below for an example. This is usually the most time-consuming step. If your data is in a database already, you'll need to export it so you can work with it in Excel or another spreadsheet program. Saving your file to .csv format (comma separated value) is best, though xls and xlsx files work too. It might help to see what a good import file should look like. You can download a sample Excel file from our article Compare your import file to a sample version. On the Home > Flex Importer, page, click the green “Import a file” button and select your import file from your computer. Click on the blue “Upload your file and go to Step 2” button. See “Upload your import file” for details. 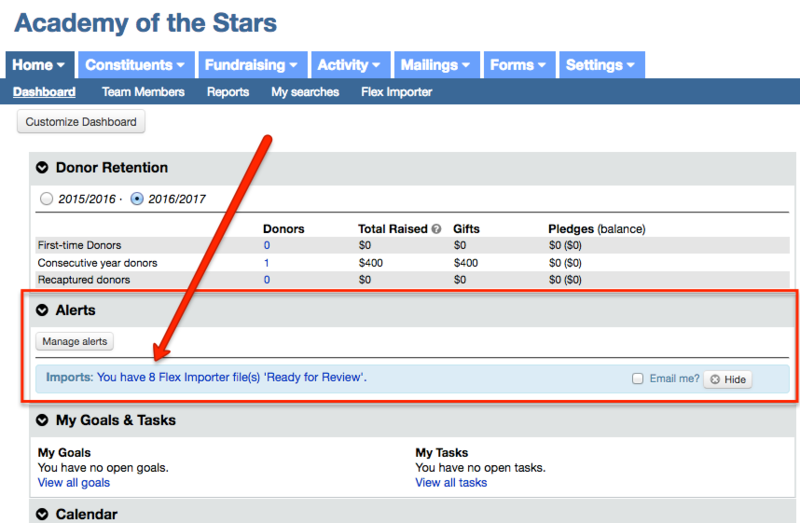 Set up your record matching and updating preferences for this import file. Then review the data mapping in your import file to the fields in LGL.A preview window will show in real time how records will look in LGL once imported. Toggle through some of the records to spot check. You can make updates to the mapping before moving to the next step if needed. Once you’re satisfied with the mapping, click the blue “Save and go to Step 3” button in the bottom-right corner of the page. Your file will be prepared for import but not yet added to your LGL account. Once it is complete, you can accept or reject it, modify the mapping, or selectively reject just new or updated records. See the mapping articles in the list at the bottom of this article for detailed instructions. For more information on previewing your import records and to save your mapping as a template for future imports, watch the video at the beginning of this article. What event registration options are compatible with LGL?